As noted in the previous article on Kolomoki Mounds, Swift Creek pottery appears to be associated with the Hitchiti-speaking tribes. At least one Hitchiti migration legend suggests they migrated north into Georgia after having first arrived by boat in the Lake Okeechobee area of Florida. 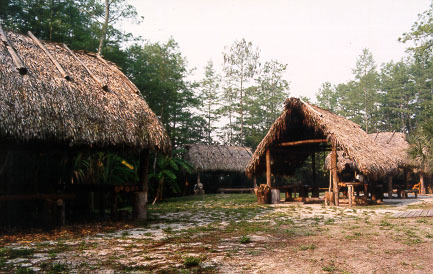 It is in this area where archaeologists have found the earliest evidence of corn agriculture, a native crop of Mexico, although this was a much smaller variety of corn than that brought later by the newcomers at Ocmulgee Mounds. 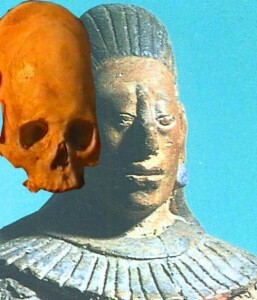 A Maya skull and statue both showing cranial deformation. Curiously the Hitchiti language has several Mayan words in it and Mesoamerican symbols have been found on Swift Creek pottery. The Maya were also known for head flattening. 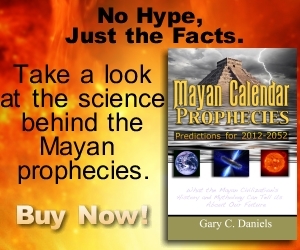 Thus all of this evidence suggests the Hitchiti (or at least some portion of them) were possibly descended from the Maya. It is likely that the Hitchiti/Swift Creek built the first stage of the funeral mound since the skeletons with cranial deformation were found there. 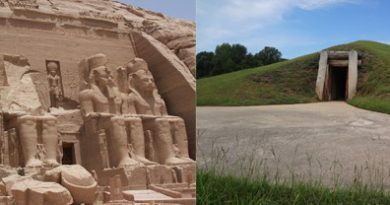 Did they also build the first stages of the Greater and Lesser temple mounds? According to another version of the Creek Migration Legend, the first structure the newcomers built upon arrival was “a mound [with a] great chamber in the center” where the warriors could gather– a clear reference to an earth lodge. Yet the legend mentions nothing about constructing the temple mounds and, in fact, their descendants would later tell European settlers they did not know who constructed the mounds. This artwork is available on a variety of merchandise in our Gift Shop including t-shirts, mugs, posters, stickers, mousepads and more. All proceeds help fund future exhibits. 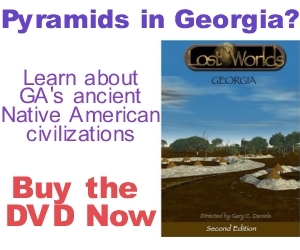 Shop Now to help support LostWorlds.org. 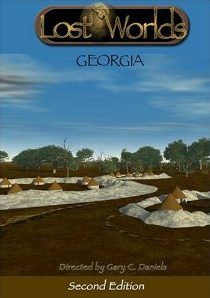 The main features of the Ocmulgee Mounds’ site plan are two truncated pyramidal earthen mounds, one larger than the other, flanking and defining an open plaza area. This site plan does not match previous known Swift Creek site plans such as at Kolomoki Mounds. The site plan does match other Mississippian site plans west of Ocmulgee Mounds such as that at Cahokia near St. Louis. Thus this evidence favors the newcomers as the builders of the Greater and Lesser Temple Mounds and central plaza as well as the Earth Lodge, as previously mentioned. Also as previously mentioned, the migration legend tells how the Cussitaws would always have scouts ahead of the main group. Ocmulgee is located on the Ocmulgee River which flows into the Altamaha River which flows into the Atlantic Ocean just south of Sapelo Island for a distance of 300 miles. 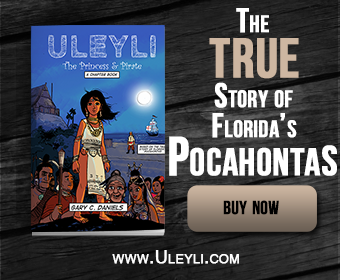 It is about a three week journey from Ocmulgee to the coast by dugout canoe. 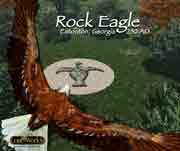 Thus as the main group rested at Ocmulgee the scouts would have reached the Atlantic Ocean and realized that their journey had ended. They could go no further east and had discovered that the sun rose from a great ocean each morning. They would return and tell the others about their discovery. 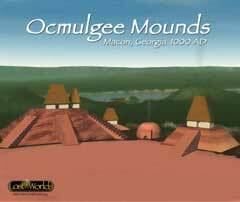 Ocmulgee thus became the logical place for a permanent settlement. It truly is where they finally “sat down.” Continues….